Usually Delivered in 30 - 31 days. This product is available in Alicdn, gearbest, Amazon.in, Flipkart. At gearbest.com you can purchase ZJ - 5890K Portable 58mm USB POS Receipt Thermal Printer for only $24.27, which is 99% less than the cost in Flipkart (Rs. 2,499). 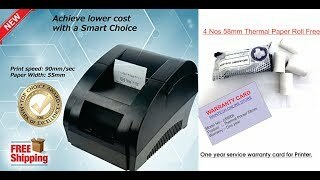 The lowest price of Zjiang ZJ5890K Thermal Receipt Printer was obtained on April 4, 2019 4:37 pm. Suitable for all types of commercial retail POS systems, the ZJIANG 5890 K ZJ is a lightweight thermal receipt printer. Designed with a smart shape, it claims to provide high-quality prints at a very low cost. It is compatible with all window systems versions and Linux operating systems. It offers 70mm/s print speed and 203DPI(8dot/mm) resolution. It is a low-noise printer that produces high-quality and speedy printing. It supports cash drawer driver. Its smart structure helps with the easy installation of paper as well as easy maintenance. It is a low-cost printer as it requires no ribbons or ink cartridges. It is easy to set up and operate. It supports multi-languages and comes with 12-month warranty period. Shenzhen Zijiang Electronics Company is a high-tech business, specializing in R&D, production, and promotion of POS printers, receipt printers, portable printers, mobile printers and other POS equipment. We’ve been focusing on the Receipt Printing Industry ever since our establishment. Following decades of development and engineering buildup, many of our researched and engineered printing equipment has gained recognition from our national and overseas clients. We’ve developed a vast selection of goods with fantastic software. With different purposes, our printers are capable of fulfilling the requirements from different areas. We have rich experience in independent research and development, which may efficiently meet our clients ODM requirements. For Manufacturing defects only. Physical and Electrical damages not covered.